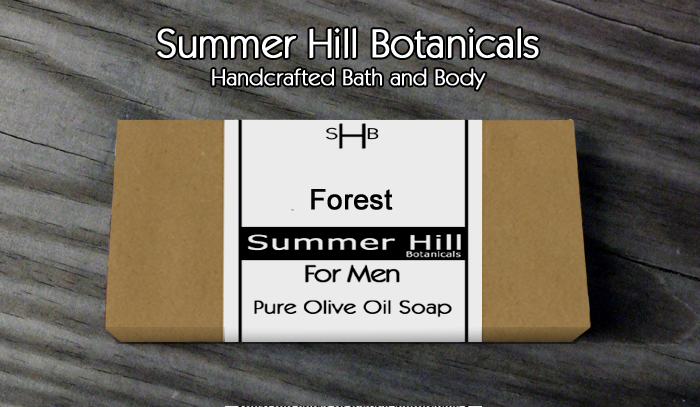 For Men - Summer Hill Botanicals. Est. 2006. Custom Handcrafted Bath & Body and Natural Skin Care. Summer Hill Botanicals. Est. 2006. Custom Handcrafted Bath & Body and Natural Skin Care. Camper's Soap, Lotion and Spray. DEET FREE! Our men's line has been a great seller since we have created it. Same quality goes into our Men's line that goes into all our Summer Hill Botanicals Natural Skin Care line. Masculine scents and manly labels. Olive oil, sunflower and coconut oil is our moisturizing base. Simple ingredients for all skin types. The scents listed below can also be made into our Hydrating Olive Oil Lotions. Just ask if you would like one. The lotions run $8 each plus shipping and sales tax if you are located in Pennsylvania. Nothing smells better than the great outdoors. Olive oil, sunflower and coconut oil makes this a moisturizing bar just for the guys. Essential oil of Patchouli and Pine reminds you of being in the deep woods. A blend of aromatic essential oils such as basil, spearmint, eucalyptus and rosemary. With our base of Olive oil, sunflower and coconut oil base to moisturize and condition your skin. A great scent for young and old. sunflower and coconut oil base. It reminds one of being on top of a high mountain with the soil and balsam tress giving their earthy, clean scent. Great for keeping dry skin hydrated. Love the smell of freshly fallen timber? A scent of the outdoors and so invigorating. Moss, raw earth and sawdust. Blended in our Olive oil, sunflower and coconut base. Very moisturizing. A unique blend of oils that any man is sure to love.